Extraordinary 20-track collection from Finnish indie favorites Cats On Fire features sold-out EP and single tracks from the band's past plus assorted rarities, unreleased tracks, and recent recordings too. Previous Cats On Fire albums ‘The Province Complains’ (2007) and ‘Our Temperance Movement’ (2009) earned the band favorable comparisons to indie legends The Smiths, Felt, Orange Juice and Pulp. The albums amassed notable reviews in the music press, including coverage by All Music Guide, The Big Takeover, NME, Q Magazine, and Pop Matters, among others. The band has played countless international shows across Scandinavia, continental Europe, the UK and the US, including sets at Sweden’s prestigious Emmaboda festival, the Indietracks festival in England, and the New York City popfest. The wonderfully generous 'Dealing in Antiques' is a comprehensive collection of non-album tracks of various origins. Some of the songs were brought down from the attic, and some of them up from the cellar. Some were simply brought forward to a more prominent place in the house, while others were polished a bit. The album features two tracks from the band’s ‘Empty Town’ demo in 2002, six songs from limited edition and long sold out Finnish 7” singles ‘Solid Work’ and ‘Happiness is Chemistry’ from 2003 and 2004, and five tracks from the 2006 ‘Draw In The Reins’ ep on fashionable Swedish imprint Fraction Discs. Among the album’s unreleased tracks are four superb early recordings from 2004, an unreleased outtake from the ‘Our Temperance Movement’ recording sessions in 2008, new song ‘The Hague’ (previewed on the ‘Matinée Grand Prix’ compilation earlier this year), and a brand new cover version of the 1997 UK number one hit ‘Your Woman’ from White Town. 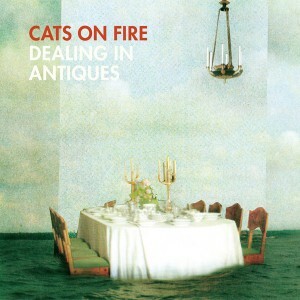 Spotlighting the brilliant evolution of Cats on Fire over the past eight years, 'Dealing in Antiques' is an essential anthology from one of today’s most popular indie groups. The band is promoting the album with a headline appearance at the San Francisco popfest in May and their first ever trip to Hong Kong in June.